If you’re planning your first time in Jimbaran Bay, you may already know that it’s the beach in Bali that’s famous for its cluster of beachfront seafood restaurants. The bay is found on Bali's southwestern coast, just south of Ngurah Rai Airport. You’ll find Bali’s largest fish market at the adjacent village of Kedonganan. There are even more rows of dining spots serving fresh seafood grills and local cuisine here. The beach and the bay of Jimbaran offers small secluded areas, with some spots lined with shaded coconut groves. It’s also home to some of Bali’s most luxurious resorts that make good use of the calmness and beauty of the seascape. Let us show you the best of Jimbaran through this survival guide for your first visit. With such a grand selection of attractions, restaurants, hotels and more, planning your trip would be a struggle without this Jimbaran survival guide. If you’re looking for a best place to enjoy a magical Bali sunset, Jimbaran Bay is top option. The local seafood dining scene is excellent, too. Most of the hotels you’ll find here are international chains and five-star resorts. Shopping and nightlife in Jimbaran, by contrast, is rather low-key. However, Jimbaran’s rocky limestone cliffs south of the bay offers spectacular sunset cocktail venues. You’ll find some of Bali’s best surf spots and reef breaks off Jimbaran’s beautiful bay and around the limestone cliff-fringed coastlines south of it. Beyond the beaches, you’ll also find ancient sea temples in the most stunning cliff-top locations (where sunsets are also magical). Just up Jimbaran’s hills, you’ll find further magnificent landmarks and monuments. From all of that choice, we suggest making sure you visit these three places on your first time in Jimbaran. The shopping scene in Jimbaran is an eclectic one. There are fashion boutiques, jewellery shops and specialty stores lining its main streets. You’ll also find a bustling traditional fresh market in the heart of the village. That means you can get both first-class products as well as a taste of local life, depending on where you go. If either of those prospects sounds like your idea of a good time, we suggest checking out the following must-see shopping venues. Right before sunset, head to the famous restaurants that line this part of Bali’s coast, either in Jimbaran or the neighbouring fishing village of Kedonganan. These seafood restaurants are laid out right on the sand and some offer live entertainment. For actual bars and clubs, the scene here leans towards a more luxurious vibe. The stunning cocktail bars on top of rocky outcrops are unlike any other in the world! When it comes to planning your first time in Jimbaran, we strongly recommend at least one evening spent at one (or all) of these places. Some of Jimbaran’s best dining spots are attached to the five-star hotels here. However, if you’re looking for the sort of food the area is famous for, look no further than Muaya Beach. This is where most of the sunset and seafood restaurants are. If this is too touristy for you, Kedonganan is also worth looking as an alternative. If you try no other restaurants during your first time in Jimbaran, you should definitely check out the following. There are many luxury resorts in Jimbaran, with tropical gardens and beach access directly into the gorgeous bay. Some other options dot the cliff edges around the Bukit peninsula, providing even more stunning ocean views. There are also a few budget and mid-range hotels in the area. From all of that choice, we’ve picked out our three favourites. 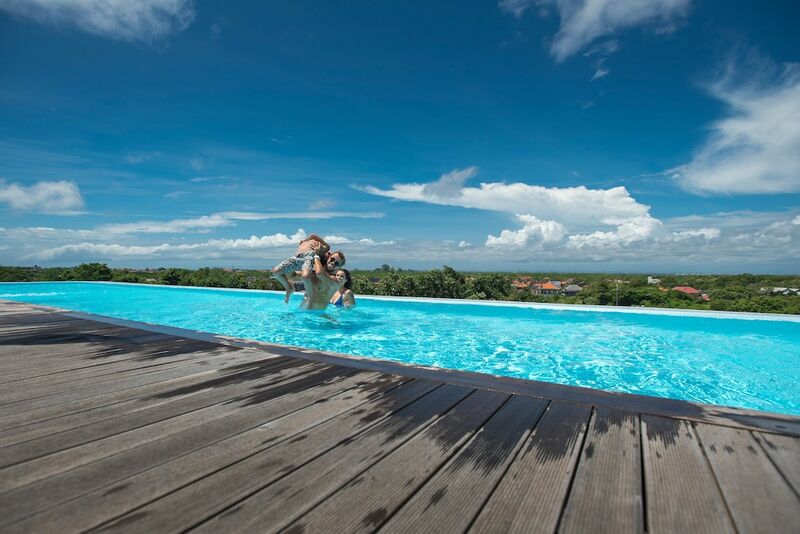 Each falls into a different price bracket, but we’re confident that they’ll all give you a great stay in Jimbaran.